Brushed aluminum frame fits in with any environment. (3) movable green-edged acrylic pockets give the impression of glass. (2) clear lenses protect graphics while displayed. Museums, art galleries, and other locations with visitors hungry for information will find these literature holders a great addition to their marketing plan. 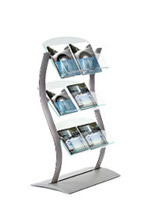 This literature display, literature holders has (3) adjustable acrylic pockets. These pockets have green edges, giving them the appearance of glass, but with the price and strength of acrylic. 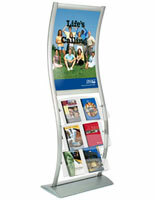 The wave displays are ideal literature holders for different sized publications with its easily movable acrylic pockets. 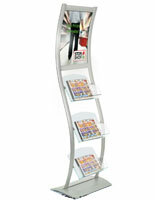 The literature holders, also known as a magazine racks, look great in any environment while attracting customers with its eye-catching design. 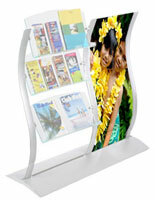 The literature holders feature (2) lenses to protect graphics placed within the display. Use these lenses to create a double-sided display, allowing you to advertise products in multiple directions. 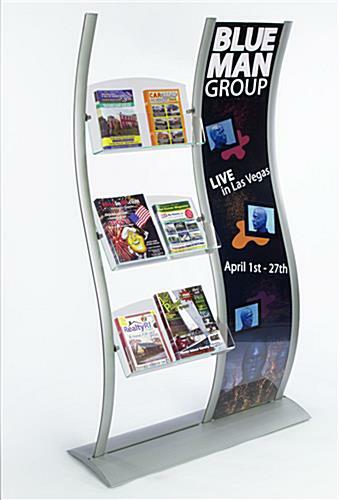 These wave displays, literature holders have a brushed aluminum frame. The brushed aluminum ensures your stand remains strong, even in areas with heavy traffic. 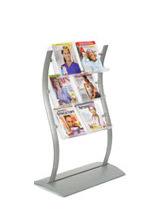 Catalog racks, retail fixtures, and other literature holders are meant for indoor use only. 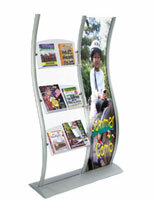 The literature holders can hold an 18" x 77" graphic. 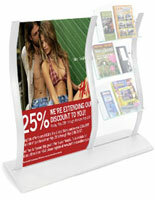 Combining a poster display with a magazine holder, use the literature holders to accentuate your marketplace today! Please Note: Graphic is not included with poster frames. When designing your images, keep in mind actual graphic size is 18"w x 77"h, where 1/2" on each side is covered. Your graphics should be printed on regular poster paper, so as to ensure they will fit securely within the grooves. This will not be a problem for any printing service facility.